My favorite Vasyl Lomachenko boxing footwork tricks. One of today’s most talented stars in boxing. With only 10 fights in his resume and already considered among TOP 5 on many fans’ pound-4-pound lists. And you wouldn’t expect anything less considering his amateur record of 396wins-1loss AND 2 Olympic gold medals. He has it all: the power, the skills, AND the aggression! Among the things I admire most about him is the incredible footwork. It’s not that frantic darting in-and-out like Manny Pacquiao or neither the explosive pouncing quickness like a young Roy Jones jr. It’s also not that smooth walking style of Pernell Whitaker or flashy showoff style of Prince Naseem. Vasyl’s style of footwork isn’t overly flashy and athletic but it still looks just as impressive. I would say he’s like a “teleporter” (like “Nightcrawler). He goes from place to place but you never see how he gets there. He moves from place to place but you never see how he gets there. Lomachenko’s a myriad of boxing tricks. I keep noticing more and more clever things he does with each fight. He’s virtually limitless in his non-stop barrage of tricks and stunts to take opponents out of position and counter them with crushing lefts and rights. And right when you’ve managed to cut him off, he teleports behind you yet again. It’s a never-end game of cat-and-mouse except only it feels like YOU (the mouse) chasing a faster and stronger Lomachenko (the cat). Lomachenko’s opponents are so busy defending his punches they never see his footwork. I noticed that Lomachenko easily outmaneuvered all his opponents ON THE INSIDE while taking almost zero damage, and while also dishing out plenty of damage in return (he’s knocked out almost everyone he’s fought thus far). Quite often when we hear of a “guy with good footwork”, we think of a fighter who runs around the ring like Muhammad Ali but that isn’t Lomachenko. He’s not wasting energy being “athletic”. He’s right in front of his opponents the entire time and outmaneuvering them embarrassingly! Whereas the top footwork guys are always “too far” for their opponents, Lomachenko can be “too far”, “too close”, “too much to one side”, or even BEHIND HIS OPPONENT! It’s the craziest thing. And he’ll even do it 20 times against even champion opponents. If you’ve ever fought a southpaw or fought AS a southpaw, the first thing they’ll tell you is to keep your front foot outside of your opponent’s front foot This is generally regarded as the best position in orthodox-vs-southpaw match-ups since the fighter with his front foot on the outside will have better attacking angles while being outside of his opponent’s range. Theoretically, it sounds simple enough but in reality it’s anything BUT simple! Both fighters have probably been taught the same thing and with both fighters trying to get outside and around their opponent, it’s likely that neither will really establish this position. But the crazy thing is Lomachenko manages to get his front foot on outside ALL THE TIME. It’s so easy for him. He’s left, he’s right, and he’s OUTSIDE AGAIN! He throws a jab, he throws a left, then a hook, and then WHAT—he’s freaken BEHIND his opponent. It’s one of the most incredible displays of skill I’ve ever seen and to see him do it repeatedly against championship-level opponents blows my mind. Throw a jab as you step your front foot outside. Except only, this isn’t Lomachenko’s trick, it’s EVERYONE’s “trick”! This is the oldest move in the book and nobody falls for it. It doesn’t work any more so you’ll have to do better than that. This worn-out trick is only listed here for contextual purposes. This trick is ALMOST as common as the first but Vasyl does it a little differently. What most fighters will do is throw a hard cross as they step their front foot outside. It makes reasonable sense; you run behind your opponent while he’s busy defending your cross. How Lomachenko does this uniquely is that he doesn’t commit much power to the left cross. In fact, his focus is only to pop it out there fast and distract you while he swiftly steps outside and around you. It’s as simple as that. Instead of putting energy into making the shot powerful, you should be trying to get it out there as quick as possible. You could approach it like a lead left, or a fast left. 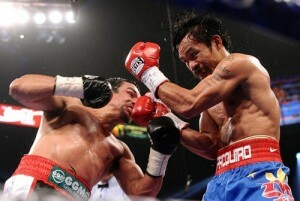 You could also do it like Manny Pacquiao who will pump double lead lefts as he runs up behind you. There isn’t much power but he’s keeping you occupied while he moves outside. The keys to this maneuver is speed and element of surprise. Throwing fast unpredictable left hands will more likely cause your opponent to instinctively rush his hands back to block, which then buys you more time to step around him. You can throw the left hand alone (like a lead left), or during a 1-2 combination (jab-cross). Step your front foot outside as you throw a fast left. You can throw the left alone as a lead, after a jab, or during a combo. It works best if you force him to think defensively (block or slip). Try mixing both fast crosses (surprise) and hard crosses (false patterns). OR, piot with a hook and then counter (likely with your left). You can keep throwing punches or also move again when he re-adjusts. This trick is very uncommon. Most fighters are usually anchoring both feet to the ground when they throw their front hook. The difference is that Vasyl MOVES or even JUMPS during his hook. Yes, his hook will have LESS power because his feet are moving, but he’s getting into a BETTER position which will allow him to do more damage anyway. I’ve seen him employ this strategy in different ways. The first way is that he throws his hook so fast that it forces his opponents to block, and that buys him time to jump around them. The other way is that he mixes in hard hooks with light hooks and right when his opponent is expecting/bracing for a hard hook, that’s when he jumps around them. In terms of technique, there are two ways to move his feet around as well. One method is to treat it like a step-jab but instead of a jab, he’s throwing a hook—a step-hook, if you will. (It’s just an arm hook, no real body rotation behind it.) The other way is that he’s rotating his body to create momentum AS IF he’s throwing a hook but then he jumps and the momentum goes into his rotating his body instead of the punch. It’s similar to how many fighters will jump to a switch stance on the inside to cut around their opponent. Step to your BACK-LEFT diagonal to anticipate his swinging right, and then counter him hard. This is very similar to trick #2 up above except only you never actually throw the left cross. This trick happens in this manner: you fake a left cross and he either tries to slip it or block it. And while he’s trying to evade your left cross (that never comes), you’re using that opportunity to cut around him and outside. This trick is most effective when you’ve ‘trained’ your opponent to expect scary hard left hands or fast hands. You want an overly-reactive opponent that responds to every twitch you make with your left hand. It helps if you’ve been mixing up hard lefts with fast lefts throughout the fight to keep him guessing. What you want is a more reactive opponent. This can make him too defensive and buy you time. This is just like trick #3 but you don’t throw the hook (you just rotate your body alone). Watching from the outside may seem like you’re just jumping around him but this isn’t the trick. It’s important that YOU MAKE HIM THINK you’re throwing a right hook; this makes getting around him that much easier. The busier he is defending a hook that ain’t coming, the easier it is for you to get around him. This trick is also easier to do when you have an opponent that blocks with both hands up and covers his own vision. Easier because he won’t see you disappearing out the side, and also because his front arm won’t prevent you from moving around him. I suppose it’s easier to make him pull his front arm up if you threaten with hard punches to the head. Like I said, it’s a game of mixing in hard and soft shots so your opponents won’t know when to expect which. It is incredibly easy (and clever) to move around your opponent when he’s crouched. This is because he can’t pivot to re-adjust to you while he’s bent down. You can try it right now and see for yourself. (Try pivoting with your knees bent or waist bent, or both.) The trick here is to figure out how to make your opponent crouch down or bend over. The first method is what I call the “mirroring method”. You basically crouch down, maybe a throw a jab to the body. Maybe throw a jab upstairs. Keep crouching down a lot and at some point he might actually crouch down to match you. NOW…when he goes down, that’s when you pop up and jump around outside his front foot. It’s that simple. It’s hilarious how easily and smoothly it works. 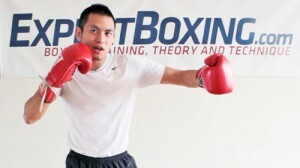 The second method is to throw a punch or fake a punch. Try throwing a left cross or faking a left cross so he slips down. You can also throw a right hook or fake a right hook so he ducks down. A third method is done by simply pulling his head down with your right hand. If he’s close enough to you (being really aggressive), you could easily reach out and pull his head down as you run around him. If you’re not that close, you could still reach out by throwing a jab or hook (or faking one) and then pull his head down just the same way. Throw a jab, left cross, or right hook. FAKE a jab, left cross, or right hook. 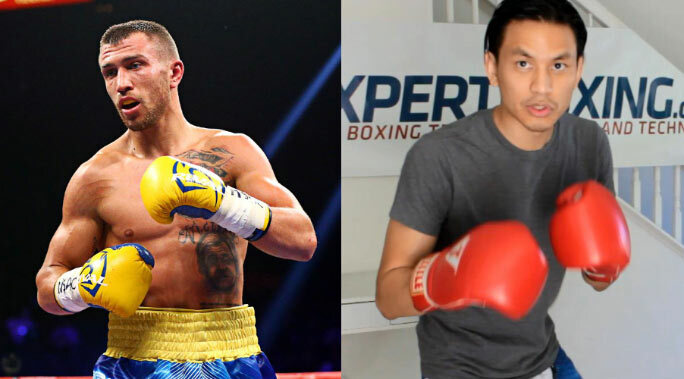 throw a left cross, and right as his opponent throws the counter right, Lomachenko will step outside of his opponent making him over-reach, over-twist, and likely fall off balance. There are several micro-skills involved to coordinate this counter-punching masterpiece. The first one is that you have to get used to slipping INSIDE punches. What most fighters will do is slip OUTSIDE the jab, and slip OUTSIDE the cross. This is the most natural way to slip because it sets up your mirroring hand to counter him on his “punching side”. (Conventional wisdom dictates for you to counter with your left hand against your opponent’s right-handed punches since he’s considered more open on the side he’s punching from. Vice versa for the other side.) Using conventional logic, slipping OUTSIDE of punches will always set up the proper hand for you to counter from. But Lomachenko is “special”; he’s different. He slips INSIDE of punches at times and this throws his opponents completely off-rhythm. It’s just so unexpected and befuddles them when his body is in a place or angle that they weren’t expecting. Not only do they miss but they also fall off balance. It all has to do with how you set up the preceding punch. Again, what most [i] fighters will do is slip OUTSIDE the jab, which then sets them up to slip OUTSIDE the cross. And if you’re slipping outside the cross, this means you’ll be moving toward your opponent’s back foot instead of his front foot. What Lomachenko does is slip INSIDE the jab, which now changes the angle of his opponent’s cross (it’ll come straight instead of across). And when the cross comes, Lomachenko now has the spacing to slip INSIDE of it and also STEP or PIVOT around his opponent’s front foot. The opponent will miss incredibly and even fall off balance if he over-committed to his punch. I’ve also seen him employ this tactic in a different way. What he’ll do is throw a left cross while anticipating a counter right, and right as the counter right comes, he moves inside and around his opponent’s left side. The technique involved here has to do with timing your body momentum to be perfect. Think of how your body has a clockwise momentum when you throw a left cross, when then sets up a counter-clockwise momentum for your right hook. Well for this particular Lomachenko tactic, he uses the return momentum of the left hand to pivot move outside of his opponent’s front foot instead of throwing a right hook. It truly is genius stuff. There is one last glaring question that needs to be answered. For those wondering, “If you’re slipping towards your opponent’s front hand, CAN’T HE JUST HIT YOU WITH A LEFT HOOK? !” And that’s what I thought, too, but it never happens when Loma does it. From what I’ve seen in his videos, he’s head is just so close to his opponent’s left shoulder that their left arm is too smothered to throw a hook. But that isn’t for a lack of trying. Many of will pull back the left hand back and throw a hook anyway but he’s too close and it just goes over his head. I’m sure he’s also got a ducking reflex trained to go along with this maneuver. If you have the timing down perfectly, slip inside of any right cross and get around your opponent’s front foot. Slip inside your opponent’s jab to alter his right cross, which gives you more space to slip inside the right cross an in the direction of your opponent’s left side. Throw a left cross anytime and using the return momentum to move around your opponent’s front foot when he throws a counter right. You never knew where he was or what he was doing. I don’t think it’s so much that he’s a footwork genius or has the fastest most swiftest legs in the world (although he certainly makes a case for it). I think his timing is so clever that his opponent’s can’t follow everything he’s doing. They’re so busy trying to punch and defend against punches that they never see him sliding his feet into position. If watching Lomachenko has made me think any different about my own fighting style, it’s that I could use more footwork during my feints. I already use a lot of footwork during my punching combinations and also move a lot within my overall style but I tend to use my feints only for creating counter-punching opportunities instead of ‘footwork opportunities’. Being long-armed, I’m naturally fighting from a distance and usually don’t go inside unless I’m trying to fend off high pressure fighters or trying to break down an opponent with high pressure myself. It was mesmerizing to see how Lomachenko used feints and footwork together so seamlessly on the inside. He transitioned effortlessly from punching to moving around you, or feinting to moving around you. You never knew where he was or what he was doing. Most guys only use footwork to set up punches. Lomachenko can use punches to set up footwork. Awesome Video on Footwork like Lomachenko!!! Thanks! Thanks, Chris! I had a lot of fun doing this one. Thanks for another excellent article Johnny. 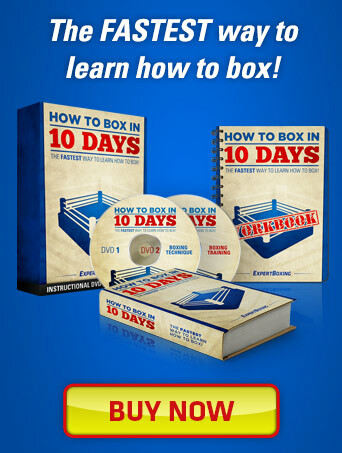 The Rigondeaux/Whitaker pieces will make for excellent reading i’m sure. How about a Terence Crawford piece, a breakdown of his remarkable switch hitting. Keep the great content coming, it’s much appreciated. I’ve got my eyes on those fighters as well, Sean. The Rigondeaux one, which I’m very excited about, is currently being edited and written. Whitaker and Crawford would be a lot of fun. Since you brought up Lomachenko, I just read that HBO’s attempt to turn him into the next mainstream boxing superstar against Marriaga was a complete and total flop, getting just 728,000 viewers on primetime ESPN which is just awful. Compare this to what the circus that is MMA’s MacGregor vs. Mayweather will do this weekend. I was wondering what you think about the current state of professional boxing as a sport. Will it ever reach the heights of glory it once had in the public’s minds? Or is it permanently relegated to the hardcores like us that train boxing as an activity, never to reach the mainstream consciousness ever again? Professional boxing is not at the height it was during the golden era but it’s doing quite well considering it’s a niche sport. Almost nobody in the US boxes any more and hardly anybody watches it either. You don’t learn it in school and the majority of its top athletes are not white Americans. Not only that but most future combat athletes are choosing MMA for its mainstream popularity. Despite all that, the sweet science continues to impress and dazzle fans everywhere, still has an official amateur organization, Olympic participation, and diehard school-of-hard-knocks culture that isn’t found in MMA. MMA has an appeal for the entire sport. Boxing used to be like that but we now only have superstars. Has there been an MMA champion as idolized and worshipped as Muhammad Ali, Mike Tyson, or Floyd Mayweather? 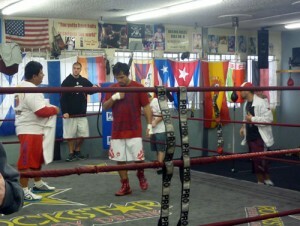 Is there any MMA champion around the world with as much social/political impact as Manny Pacquiao? Either way, I think the presence of MMA makes boxing better and forces promoters to work harder to deliver a better experience for fight fans. I think boxing needs to be run by young and innovative people who can come up with creative ideas to market the sport. At its current state it has no chance of competing for fans with MMA. There are definitely some younger heads in the game trying to be innovative but quite tricky when the old heads in boxing still control the belts and the sport overall. The boxing industry is a bit slow to move in some ways. With that said, the sport is still doing pretty well. Someway, somehow, it manages to stay alive. People really seem to be misunderstanding what Lomachenko does and how he does it. We train both stances equally. We spar daily. We work on this sort of positioning daily. I can tell you from 10s of 1000s of attempts that its not as complicated as people seem to think it is. To step around someone reliably and effectively, you have to do one thing and one thing only…. make the opponent plant his weight. It doesn’t matter how you do it. It’s even better when he does it himself (excessive body movement, exaggerated rolling under punches like Marriaga) as it preserves energy and they do the “set up” for you. Whether it’s from a hard cross to the body or subsequent fake after landing the same, off him rolling under a sloppy hook or whatever, there is only one common thread – they must settle their weight before you step. Either of their own accord or because they were tricked into it. Failure to make them settle before moving will mean that in almost every case they will simply move away, pivot out etc you as you attempt to make your move around them. Further, the best things he does are things no one even notices or talks about. He “tests” the waters constantly. He conditions the opponent not to respond. He makes a big step outside his lead and then steps back. He steps around and doesn’t hit. He does a lot of these important things so that the opponent NEVER feels desperate or at risk when he moves. By the time the opponent is slowing down and totally unsure of what to do, are frustrated, can’t put a hand on him etc etc etc… he starts stepping around them and hitting them because at this point they are largely defenseless and broken. Hey, man! I think you figured it all out. You explained exactly how I would have done it myself. I would just test the waters and get him used to me moving around him and not getting alarmed. And then in the moment that counts, that’s when I spin. With that said, that he manages to do it at the world championship level and most other fighters (even other great fighters) have not is pretty darn impressive. That he continues to get away with the same tactics over and over shows that he’s doing something entirely different from what we think we’re seeing. Lomachenkos true talent is not his footwork. It’s his discipline. He follows a step by step process to slowly lead the opponent to his own defeat. Few to no big shots. No thundering combinations to wow the crowd or judges. Just a slow, even paced grind of highly accurate, highly varied shots and good positioning to keep the balance in his favor at all times, being able to deliver damage while taking none… until the opponent no longer knows what and where to defend. By this time, they’ve lost and the last few rounds aro merely a formality. “You can be sure of succeeding in your attacks if you only attack places which are undefended. You can ensure the safety of your defence if you only hold positions that cannot be attacked. Hi Johnny, next you should do Emanuel Augustus. Here’s his highlight video (the best part starts around 0:40) https://www.youtube.com/watch?v=n6z2UE0hdT8. Thanks for the suggestion. He’s a fun fighter to watch and does many useful things. It’s actually very difficult to break down his style as 1) he does many different things and 2) he doesn’t always win. Haha, that doesn’t surprise me one bit. Sometimes my most frustrating opponents are guys that are too busy dancing around and putting on a show than actually doing any fighting. Yeah, he’s definitely a fun fighter to watch and like you said, he doesn’t win all his matches which is unfortunate. From what I have read, outside the ring he’s known to be a crazy person and taking on fights that he shouldn’t. There is an interview with Mayweather saying that he’s was one of his toughest opponent. I’m pretty that’s what his opponents are thinking to do but then he does his tricks again and he’s so clever that they don’t notice when he’s doing them or when he’s about to do them. How can you counter a move that you don’t feel? pointing your feet to move in the direction you choose was what I was taught with footwork learning how to angle your body and move according to controlling the pace of the fight, this was what I was taught with footwork and what to do with it, but what do you think? And another thing why don’t you write a article on ring genneralship like controlling the centre of the ring and fighting to short sharp burst towards the end of each round? Yes, pointing your feet in the direction you want to move is good logical advice. Ring generalship is a really trick subject that distance, position, and pacing. Thanks for the request. I’ll start cooking it up. Great article Johnny!! Are there any orthodox fighters past of present that have a similar style? Obviously there’s elements of many fighters in there Finito, Tyson, but is there anyone you can think of that is similar? TOUGH QUESTION! I have to see anybody like that. I think Pernell Whitaker might be the closest thing. He’s also an extremely dexterous southpaw with quick head movement and clever feet. As for orthodox…ehhhh…I really don’t know. Vasyl is truly unique for me. Hi, ive read quite a few of your articles and have enjoyed them. I was going through some and ran into an older one on swarmers. I am not one who does this , but have enjoyed watching some that do. My question is do you still feel the same way ( you were a little harsh) or somewhat changed. As for Lomachenko, i would like to know how he would compare to a Willie Pep. Thanks. Hi David, which part did you feel was harsh? I’m not sure I follow you. I would have to watch more Willie Pep to really make the comparison but both are certified all-time greats for me.